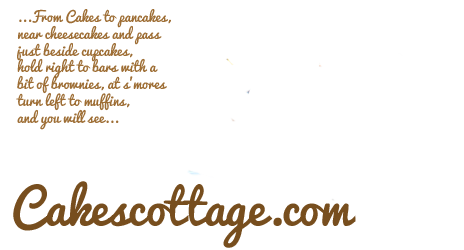 Smooth, rich, decadent, chocolatey CHOCOLATE! 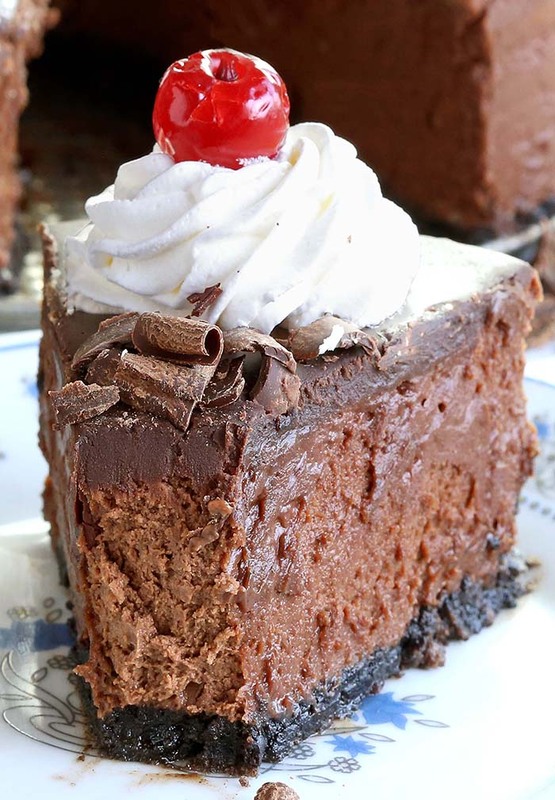 Triple Chocolate Cheesecake with whipped cream and cherries, is simply a dream come true for any chocolate lover….like me! Want a special chocolate treat for Valentine’s Day ? Or decadent dessert to bring to the Thanksgiving or Christmas gathering that will get that “Wow! 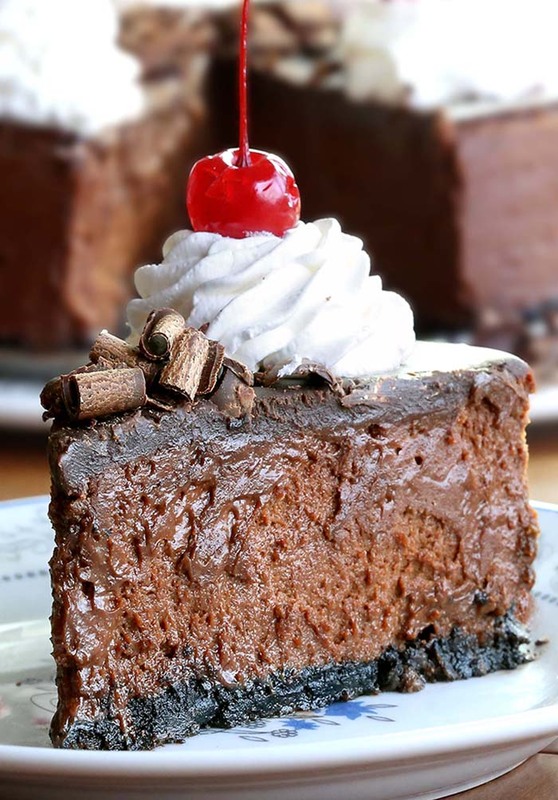 How did you do that?” factor without hours of hard work, then Triple Chocolate Cheesecake with whipped cream and cherries is definitely the dessert you will want to make! Not only does it look delicious, it tastes equally delicious! The combination of chocolate and cherries is luxurious, and since the Valentine’s Day is just a couple of weeks away which means it’s time for all things pink, red, and CHOCOLATE!!!! It’s the holiday of love and also of destroying everyone’s New Year’s resolution to limit sweets/eat healthier/lose weight. 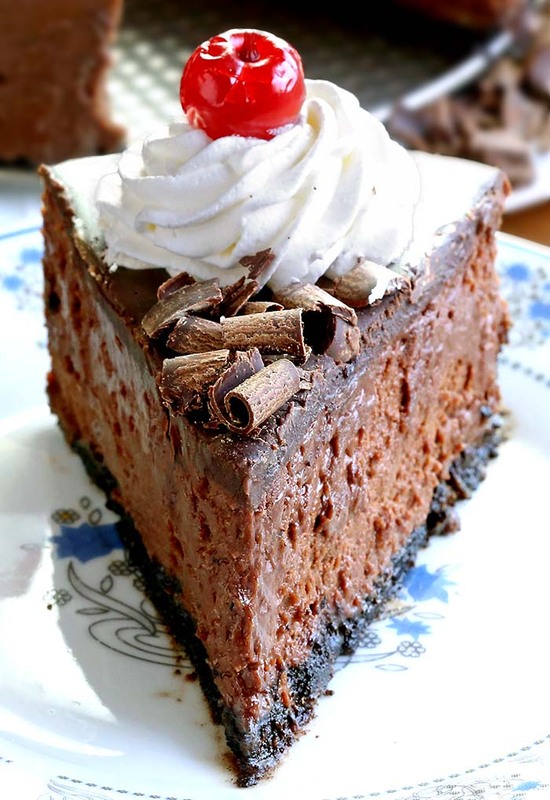 But let me tell ya, this Triple Chocolate Cheesecake is WORTH IT! Happy Valentine’s Day to ya all! Alone on Valentine’s? This Triple Chocolate Cheesecake Will Keep You Company 🙂 This thick, rich chocolate cheesecake is what real dreams are made of! Preheat oven to 350 degrees F, wrap the bottom of the spring form pan with heavy tin foil. Butter or spray with a non stick spray a 9-inch springform pan and set aside. In a medium sized bowl combine the oreo crumbs and melted butter. Press the crumbs evenly over the bottom of the pan. Cover and refrigerate while you make the filling. Melt the chopped chocolate and set aside to cool. Meanwhile, in a large bowl beat the cream cheese and sour cream on medium low speed, until smooth. Gradually beat in the sugar. Add the eggs, one at a time, beating well after each addition. Add the vanilla extract and the melted chocolate and beat until fully incorporated. Remove the crust from the refrigerator and pour in the filling. Place the cheesecake pan on a larger baking pan, fill with an inch to two inches of hot water, and place in the oven. Bake for about 50 - 60 minutes or until firm around edges but the center of the cheesecake will still look a little wet and wobbly. 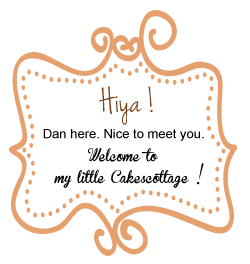 Remove from oven and run a knife or spatula around the inside edge of pan to loosen the cake. Heat ⅓ cup of heavy cream and butter in a small saucepan over medium-high until just boiling. Pour over chopped chocolate in a small heatproof bowl, and let stand until chocolate melts, then stir until smooth. Cool slightly and then pour over cheesecake. Refrigerate for a few hours or overnight. Pour ⅔ cup of heavy whipping cream into the cold bowl, slowly add the powdered sugar and whisk on high speed until medium to stiff peaks form. Add the whipped cream in a piping bag, and pipe the decorative swirls on cheesecake top using a large open star tip. 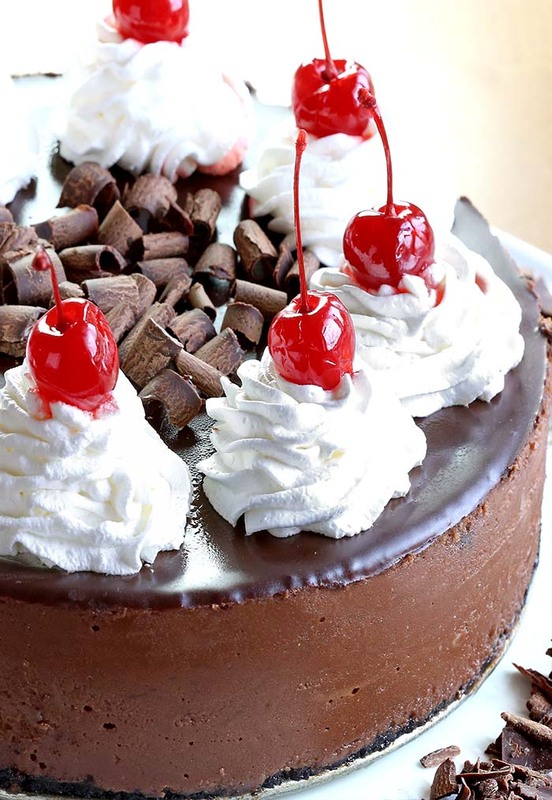 This entry was posted in Cakes, Holiday and tagged chocolate, cream cheese, maraschino cherries, Oreo on January 15, 2018 by Dan. Pictures are stunning. I love your blog.